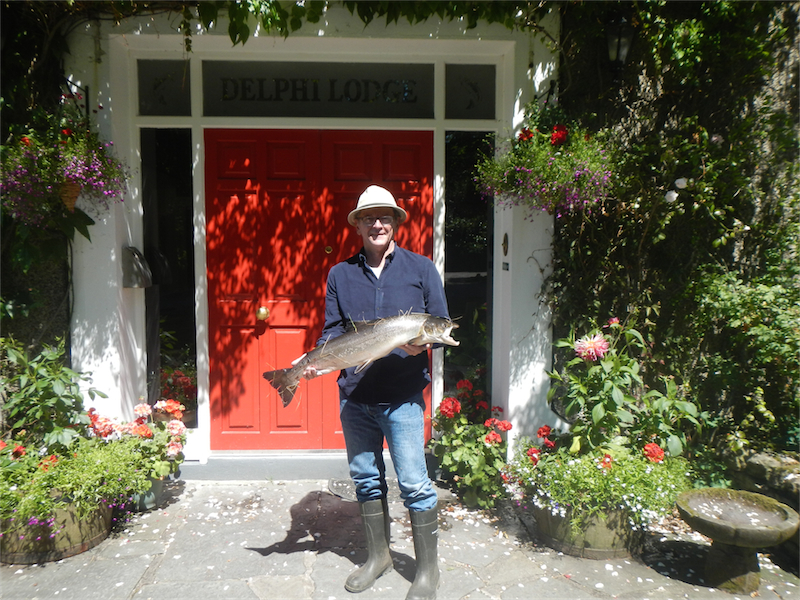 Fishing conditions here at Delphi were extremely difficult all week until Friday as we finally got some much needed rain on Thursday night, 21.3mms to be exact which put the river up to 40 by lunchtime. After the long dry spell it was however rather coloured at first. This was in stark contrast to earlier in the week when our Mediterranean weather continued and the river dropped off to minus 10, with the tip of the rock in the Quarry pool just visible by Thursday. It made fishing the river very difficult because of low flows, with most people concentrating on the Turn and the Quarry pools. Tuesday was a truly incredible day almost flat calm and clear blue skies. 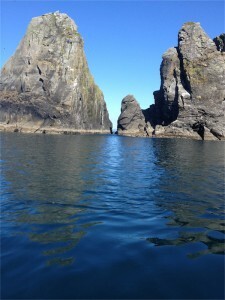 I personally had a group sea fishing with John Brittain out of Cleggan and the scenic picture below is actually of a sea stack and the cliffs on the west side of InisTurk. You could probably count on one hand the number of days in the year you could get that close to these cliffs. Air temperatures peaked at 22.9 degrees C with the water temperature rising to an amazing 21 degrees C.
This however did not deter Patrick Hughes from Melbourne who managed to land his first ever salmon, a cracking 12lbs5oz fish from the Turn pool on a beaded nymph. Giovanni Mazzoleni from Florence also managed to wangle one out of the Turn pool of 6lbs11ozs also on a beaded nymph. We must spare a thought for Janet Till from Devon who was also seeking that elusive first ever, managed to hook numerous but didn’t manage to hold on, which was indeed a great pity. Michael Fisher did manage to land a beautiful 2.8lbs approx. sea trout off Finlough. I must again give credit to all our anglers earlier in the week as they thoroughly enjoyed the social aspect of their holiday despite the terrible fishing conditions. Thursday night, Friday morning the rain finally came and the river albeit a bit coloured became fishable again. 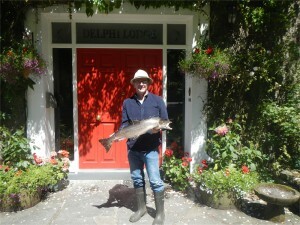 There was a fish lost in the Rock pool just before lunch and then in the afternoon Reinhard Mittmann managed to land a good fish of 6lbs14.5ozs off the Stream on Fin on a Delphi Collie. He landed the fish just in time see the Germany beat France in the World Cup. Today the river was in lovely order with the water running at 28. There were quite a few fish seen and lost and as of this point in time we have landed two. 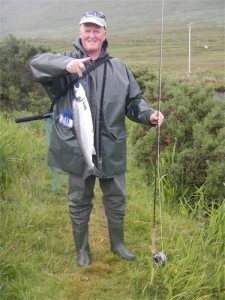 Ash Mathews had the first, a sea liced 6lbs15oz fish off the Whin pool on a Sunrae Shadow. Pat Cassidy had the second, a picture perfect grilse of 4lbs6ozs taken in the Quarry Run on a Delphi Collie.